What’s a more powerful conservation incentive – a government jail or a spiritual punishment? Myint Naing has one of the easier jobs in the Myanmar forestry department. Since 1999 his task has been to protect the Zee-O Thit-Hla sacred forest, which has been a government forest reserve since 1988. No one has cut a tree during that period. Is it the fear of a three-year prison sentence that has kept this cool holy grove intact while its surroundings lie barren and baking? Or might it be the protective nats? While the Zeeo Thit Hla sacred forest, also known as the Ingyin nature reserve, near to the ancient temples of Bagan, might have government protection, I sense that its real power lies in things that go bump in the night. Throughout Asia one hears stories. A jealous wife puts a black magic curse on her husband’s mistress that makes the woman go mad. A man coughs blood, and when doctors X-ray his lungs they find dozens of metal pins, put there by a sorcerer. A farmer spends the night in the forest and when dawn comes villagers find that he has entranced a man-eating tiger into a cage. Trouble is, when you try to meet some of these magic-imbued people, the answer results in many-degrees-of-separation — these surreal episodes always seem to take place “in a distant village, over the next hill”. To get to the Zee-O Thit-Hla forest (the name roughly translates as beautiful old forest of Zee O village) I drive about ten kilometres outside the famous ruins of Bagan in the direction of Mount Popa, turn north and bounce along for 12 kilometres on a rutted dusty track best suited for ox carts or sturdy four-wheel-drive vehicles. I pass fields of parched earth, a desiccated land punctuated by fallow groundnut cultivations and one or two villages in which life in the thatched roof houses probably hasn’t changed all that much since the monumental stupas of Bagan were built a thousand years ago. U Thu Taw, an age-softened man wearing an immaculate long-sleeved white shirt with a Nehru collar, white turban and checked longyi, in the calm manner of many Burmese, didn’t seem especially surprised to see a stranger pop into his dusty village of a thousand people and start asking about the local sacred forest. If a visitor asks the right questions he can find sacred forests throughout the swath of Hindu/Buddhist countries that runs from India through southern China and across to Vietnam. Holy groves are protected areas that frequently have no government status, but nevertheless remain forested oases in often-heavily populated areas. Local people generally insist that anyone who enters these holy forests must follow strict folk taboos — no swearing or loud noise, no lewd behaviour (one couple reportedly became barren after they had a tryst in the forest), and don’t take anything out, not even a twig. At the entrance to the 16-hectare (40-acre) forest we ask if I should remove my shoes. U Thu Taw murmured a vague incantation to the forest spirits: “This is a visitor with tender soles, give him permission to wear shoes.” Apparently he received an okay, and he nodded agreement. Not wishing to tempt fate though, I removed my hiking boots and socks. 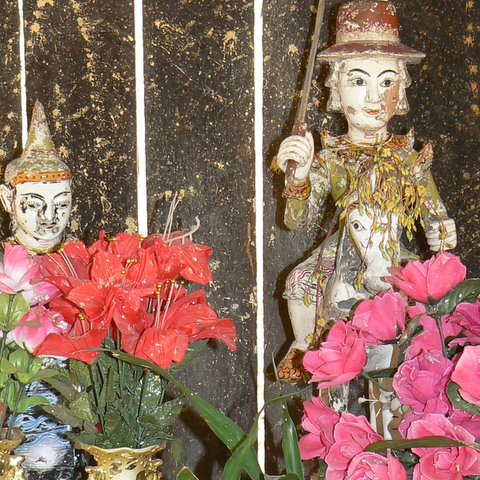 A tin-roofed shed near the forest’s entrance contains gaudy-colored, puppet-sized statues of the forest’s guardian nat spirits, demi-deities which in Myanmar control important events in people’s lives. Villagers offer garlands of plastic flowers to representations of nat brother and sister U Hla Tin Aung and Daw Pun Mya Yin. The air is cool inside the forest, a welcome relief from the arid, cactus-dotted landscapes outside the perimeter. I stroll amidst mature Shorea trees so large I can’t put my arms around them, including several fine Ficus trees, which are seldom found in the arid zone; some 35 tree species have been catalogued in this oasis of green. Some experts believe that Zee-O Thit-Hla is a relict forest, a rare example of a richer flora that existed prior to the deforestation that accompanied the 11th to 13th century construction of the great temples of Bagan. This is conservation by the people, for the people. Sacred groves, or “life reserves”, as one villager describes them, survive today because they serve people’s physical and spiritual needs. In one sense, sacred forests fit my Cartesian, left-brained worldview — they act as watersheds, offer shelter for animals, are repositories for medicinal plants and, in an emergency and given the proper ceremonies, can provide timber to rebuild a village ravaged by fire. But they are also places of magic. When I was a boy I believed in gardens filled with unicorns and sprites and goblins. I know these special places existed — I saw them in my picture books and in my mind’s eye. I am introduced to the hapless father-in-law. U Aung Khin is 84 (“my secret of long life is rice and toddy”) and half deaf. Our translator shouts into his good ear, but to no avail. He is either embarrassed to speak about the event, or his memory is gone. He cannot confirm or deny U Aye San’s story.